With Halloween just three weeks away, is there really a better time to avoid a legacy nightmare? We didn’t think so either, so we’re offering you a special treat with no tricks! It’s Postema Marketing Group’s simple potion, which includes a free copy of the best-selling book, Avoiding a Legacy Nightmare, and a $250 gift certificate to the PMG online store. Beneficiary review is a field-proven conversation starter, and nothing opens the door to that dialogue better than Avoiding a Legacy Nightmare. 1. 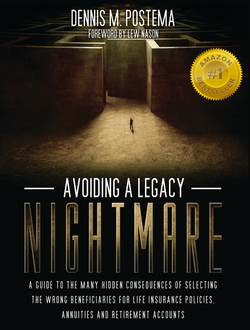 Click here to watch 3 short videos from author and multi-million dollar producer, Dennis M Postema, on how to effectively use Avoiding a Legacy Nightmare. 2. Be one of the first ten (10) to respond and contract with PMG for one or more of our industry-best annuity or life carriers before October 31st to receive your free copy of Avoiding a Legacy Nightmare plus a $250 gift certificate to the PMG online store. 3. Follow the suggestions in the videos, and use Avoiding a Legacy Nightmare to educate your prospects, set appointments, and close more cases. 4. Shop the PMG online store for additional books, booklets, seminar kits, and more to help grow your business even further! *Offer is available only to those who are NOT currently a contracted life or annuity agent with PMG. To receive offer, agents must contract with one of PMG’s Tier 1 life or annuity carriers OR two of PMG’s Tier 2 life or annuity carriers. The $250 PMG Gift Certificate expires 90 days after contract approval date.